New York Rangers President and General Manager Glen Sather announced today that the club has agreed to terms with free agent forward Mats Zuccarello Aasen. Mats Zuccarello Aasen emerged as a big star in the Swedish elite league, winning MVP honors after crossing the border from his native Norway in 2008. Zuccarello Aasen, 22, skated in 55 games with MODO of the Swedish Elite League (SEL) this past season, registering 23 goals and 41 assists for 64 points, along with 62 penalty minutes. He established career-highs in games played, goals, assists, points and penalty minutes. Zuccarello Aasen led the SEL in scoring with 64 points, en route to capturing the Guldhjälmen award as the league’s Most Valuable Player. He also ranked third in the league in goals and shots (164), tied for third in assists, and led all SEL forwards in average icetime (22:17). The 5-9, 170-pounder has appeared in 90 career SEL games with Modo, recording 35 goals and 69 assists for 104 points, along with 10 penalty minutes. Zuccarello Aasen has also skated in 98 career games with Frisk Asker of the GET-ligaen in Norway, registering 63 goals and 68 assists for 131 points, including 96 penalty minutes. He captured the Norwegian “Player of the Year” award in 2007-08, ranking second in the league in assists (40), third in points (64) and tied for sixth in goals (24). Zuccarello Aasen led the league in playoff scoring that season, ranking first in goals (12), assists (15) and points (27) in 15 post-season games. Internationally, the Oslo, Norway native has represented his country in several tournaments, including the 2010 Winter Olympics in Vancouver, Canada, finishing third on the team in scoring with three points (one goal and two assists) in four contests. Recently, Zuccarello Aasen participated in the 2010 World Championship in Germany, marking his third World Championship appearance with Norway. He finished the tournament tied for the team lead with three goals and second on Norway with four points in six contests. 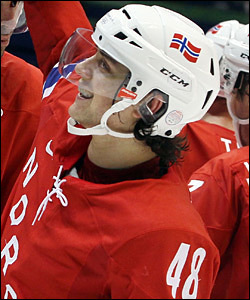 He also led Norway with 17 shots on goal and two game winning goals in the tournament.